Specialty fruit crops represent a substantial portion of the value of agricultural production in the Pacific Northwest. Climate change may threaten water sources, lengthen the dry season, raise temperatures during both the winter chilling period and the growing season, and facilitate the spread of fungal diseases and insects. Such changes have the potential to substantially reduce net returns due to increased input costs and altered yields and product quality. Many management strategies that are already being used to prolong growing seasons in marginal production areas and to improve production and quality in established production regions may also be useful as adaptation strategies under a changing climate. These strategies mostly involve moderating temperatures and controlling or compensating for mismatches between phenology and seasonal weather conditions. 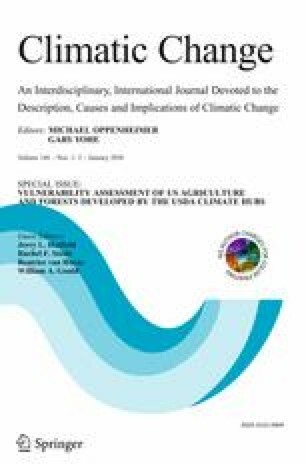 This article is part of a Special Issue on ‘Vulnerability Assessment of US Agriculture and Forests developed by the USDA Climate Hubs’ edited by Jerry L. Hatfield, Rachel Steele, Beatrice van Horne, and William Gould. The online version of this article (doi: 10.1007/s10584-017-1951-y) contains supplementary material, which is available to authorized users. An erratum to this article is available at https://doi.org/10.1007/s10584-017-2017-x. The term “warmest year on record” is becoming commonplace. Globally, 2016 was the hottest year on record for the third consecutive year, and the fifth time this record has been broken in the twenty-first century (NOAA 2017). The science community is in agreement that climate change is happening, and we are already experiencing the impacts (IPCC 2014; Melillo et al. 2014). In the Northwest, the average annual temperature rose about 1.3 °F over the last century (Mote et al. 2014). In 2015, Oregon and Washington experienced their hottest year on record (NOAA 2016), which provided specialty fruit growers in the region with a unique opportunity to glimpse what climate models have projected to be the “normal” climate of the future. This warming trend affects the agricultural industry in the form of heat waves, short- and long-term drought, and warmer winters. Currently, many of the effects are mild or positive, but by mid-century, climate impacts are projected to be negative on most crop and livestock enterprises (Hatfield et al. 2014). Climate conditions also affect food availability and quality through their influence on global food system activities such as food processing, packaging transportation, and storage (Brown et al. 2015). It is the combined effect on all these systems that will determine the economic viability of fruit crops in the Northwest. This paper highlights changes in climate and key vulnerabilities that are already influencing specialty fruit crop production in the Northwest. We also aim to identify adaptation strategies and actions that may improve both yields and quality of crops, and retain the economic viability of specialty fruit crops in the region. Specialty crops are defined by the USDA, as fruits and vegetables, tree nuts, dried fruits, and horticulture and nursery crops. This paper focuses on fruit production because it represents a large portion of specialty crops in the region. The Northwest, with its cool, wet winters and warm, dry summers, relatively abundant water sources, and inexpensive electricity, is uniquely suited for the production of specialty crops. The region also has rich soils and diverse climates that provide a wide range of growing conditions for a multitude of crops. For example, Washington’s Yakima Valley and Oregon’s Willamette Valley support hundreds of high-value specialty crops. On the other extreme, the dry eastern regions of OR and WA, such as the Palouse, are most suitable for dryland wheat farms. Within each agricultural region, the availability of water for irrigation and the existence of microclimates make it possible to grow sensitive crops in climate zones that would otherwise be unsuitable. Additionally, deep-water ports and international airports make the exporting of fresh and processed fruit product feasible and economically profitable. Regional climates, availability of irrigation water, and proximity to processors and markets, all play a role in determining the economic profitability of specialty crops for individual producers. These factors contribute to the Northwest’s status as the leading producer of U.S. tree fruit, nuts, and berries. In 2014, the region ranked among the top three producing states, by value of production, for 40 different specialty crops, including a variety of tree fruits, nuts, berries, and grapes (Table 1). By value of sales, the Northwest is the leading producer of fruits, nuts, and berries, with Washington and Oregon ranking first and sixth in the nation (USDA 2014). Apples, pears, and cherries represent a large portion of these products. On average, by volume, the Northwest region produces about 66% of the U.S. apple crop, 75% of the pear crop, and 82% of the cherry crop (USDA/NASS 2016). The region is also second in production of grapes, after California (USDA/NASS 2016). In 2015, the value of production for these four crops in Oregon and Washington was nearly $3.8 billion (Table 2). The region also produced nearly half of the nation’s processed blueberry market and over 95% of the processed blackberry and raspberry market (USDA/NASS 2016). Many of these fruits are also very important to the region’s export industry. For example, the Pacific Northwest exported 36% of its fresh apple crop and 31% of its pear and cherry crops, with the majority of these exports going to Canada, China, and India (Northwest Horticultural Council 2016). Annual average temperature in the Northwest increased by about 0.7 °C (1.3 °F) during 1895–2011 and is projected to increase by 1.8–5.4 °C (3.3–9.7 °F) by 2070–2090 compared to 1970–1999 (Mote et al. 2014). The length of the frost-free season (and corresponding growing season) has been increasing since the 1980s and is projected to continue lengthening, particularly in the western USA (Walsh et al. 2014). Spring snowmelt in the Northwest is projected to occur three to four weeks earlier by mid-century, and summer stream flows are likely to decline (Mote et al. 2014). Based on observations from 1948 to 2000, warmer winters are already causing spring runoff to peak 10–30 days earlier than they did in the mid 1900s throughout the Northwest (Stewart et al. 2004, 2005). Annual precipitation in the Northwest has generally increased since 1900, although annual variability is large compared to the trend (Mote et al. 2014). Statistically significant increases in total rainfall have been greatest in the spring, and in the future, precipitation is expected to increase slightly overall, but decrease during the summer (Abatzoglou et al. 2014). Heavy downpours are increasing nationally, and increased frequency and intensity of extreme precipitation events are projected for all U.S. regions (Walsh et al. 2014). Heat waves have become more frequent and intense, especially in the West, and are projected to become more intense everywhere (Walsh et al. 2014). In the Cascades, as cool-season temperatures have risen over the past several decades, snowpack has declined by an average of 20%—and up to 60% in some areas (Mote et al. 2005, 2014; Mote 2006). These changes in the Pacific Northwest’s climate pose significant challenges and some benefits to agricultural production. The challenges and benefits focus mostly around shifting climate zones and water availability which will significantly influence crop choices, yield and quality of crops, and farm net returns. In the Northwest, climate change will greatly influence hardiness zones, influencing growing season length chilling hours, false springs, the timing of flowering, extreme temperatures, and the life cycle of pests and diseases. These changes will have both positive and negative impacts on the region’s agricultural production, dependent on the location as well as the fruit species and cultivars being produced. One positive effect will be increasing CO2 levels in the atmosphere which is expected to have a beneficial fertilization effect on most commodities, at least until mid-twenty-first century (Eigenbrode et al. 2013). However, some of these benefits may be offset by increased pest pressures, heat stress, and water shortages linked to shifting climate zones. Changes are already negatively impacting fruit production in the Northwest. For example, in 2015 (a record breaking heat year, with low snowpack), the Washington blueberry industry lost an estimated $10 million of fruit due to heat and inadequate water for irrigation (Schreiber 2016). Similarly, in 2003 extreme heat resulted in several apple orchards loosing up to 25% of their crop to sunburn (Schrader et al. 2003). The warming climate is causing hardiness zones to shift northward (Climate Central 2015, Parker and Abatzoglou 2016). The shift in hardiness zones will result in economic challenges as producers shift operations to more suitable climates, change cropping systems, and invest in a variety of adaptation methods as climate change progresses. Though not the focus of this paper, these changes will also impact the processing and distribution centers, as they adapt to changes in products and/or incur higher transport costs. Fruit-producing areas worldwide are losing the ability to grow tree fruit successfully as a consequence of inadequate winter chill hours (Rosenzweig et al. 2011, Luedeling et al. 2011, and Baldocchi and Wong 2008). Inadequate chilling can impair development of next year’s fruit buds, cause bloom buttoning, which can serve as an overwintering site for insects and disease, and reduce fruit quality related to color, texture, and flavor (Byrne and Bacon no date). It can also change the timing of flowering and reduce yields due to fruit set efficiency and timing of pollination (Cannell and Smith 1986). Chilling hours is a key factor that will influence fruit production in the Northwest. Chill hour requirements and hardiness zones for several fruits grown in the Northwest are presented in Table 3. Changes in chill hours will vary significantly across the region. To illustrate this, we projected accumulated chill hours for Corvallis, Oregon and Wenatchee, Washington, comparing conditions in the 2030s (2020–2049 average) to a historical baseline (1976–2005 average). We computed daily chilling hours as a function of minimum and maximum daily temperature following Baldocchi and Wong (2008). Table A1 in the appendix shows how chilling hours were assigned. We used historic and future daily minimum and maximum temperatures obtained from 20 global climate models from the Coupled Model Intercomparison Project phase 5 (CMIP5) (Taylor et al. 2012) forced with a low and a high scenario of future greenhouse gas (GHG) concentrations, called representative concentration pathways (RCPs) (van Vuuren et al. 2011). The “low” GHG scenario (RCP4.5) represents moderate global efforts to curb GHG emissions and the “high” GHG scenario (RCP8.5) represents increasing GHGs under a business-as-usual assumption; projected changes in global mean surface temperature associated with these scenarios are likely to be in the range of 0.9–2.0 °C and 1.4–2.6 °C, respectively, by the 2046–2065 period relative to the 1986–2005 period (IPCC 2014). These data were statistically downscaled to a 4 × 4 km grid (Abatzoglou and Brown 2012) from which data for Corvallis and Wenatchee were extracted and analyzed. The change in accumulated chill hours for Corvallis and Wenatchee by the 2030’s is depicted in Fig. 1. In Corvallis, sufficient chill hours may not be reached prior to the last killing frost for some of the higher chill varieties, which require 800–1000 chill hours to produce consistently. This will make fruit crops in these areas susceptible to frost damage, reducing yields and fruit quality. However, in Wenatchee, future changes in accumulated chill hours will be small. The effect of fewer chilling hours may be less important for fruit crops such as blueberry for which reducing chilling requirements has been a major goal of breeding programs over the last 50 years, and have resulted in blueberry cultivars with zero chilling requirements (Hancock et al. 2008). The decline in chill hours, however, may have a positive impact on grape production in the Northwest, as frost-free days in the region increase grape production opportunities. Global warming will lead to a shift in the geographic distribution of wine production in the next half century (Hannah et al. 2013) and premium grape growing regions may shift along with grape variety cultivation (Mozell and Thach 2014). On a global scale, many regions that currently grow wine grapes will become too warm by 2050 and the area suitable for viticulture could decrease by 19 to 62% for a “low” GHG scenario (RCP4.5) or by 25 to 73% for a “high” GHG scenario (RCP8.5) (Hannah et al. 2013). In the USA, by the late twenty-first century, grape and wine production will likely be restricted to the Northwest and Northeast and a narrow West Coast region, assuming the IPCC’s A2 greenhouse emission scenario (White et al. 2006). Climate change, in this case, may actually be beneficial for Washington and Oregon, which will have less frost and greater potential for premium wine sites for at least the next 50–100 years (Diffenbaugh et al. 2011). This comparative economic advantage, however, hinges on the premise that producers will have adequate water supplies. As the region warms, further declines in snowpack will increasingly burden the region’s water supplies and increase the probability of heat stress in many crops (Mote et al. 2014). Shifting climate zones will result in earlier spring onset and may lead to more false springs, resulting in frost damage to fruiting buds from subsequent freezing temperatures. In the Northwest, these false springs are projected to decline in frequency by the end of this century (Allstadt et al. 2015, Peterson and Abatzoglou 2014). However, the spatially variable effects on spring onset and false springs may make local predictions of change difficult (Allstadt et al. 2015), and minimum temperatures during early spring will still provide conditions for damaging frost events despite the warming trend (Stöckle et al. 2010). Earlier and warmer springs will also pose challenges for pest management. For example, in the Northwest under some climate change scenarios, powdery mildew is projected to increase and codling moths may appear 4–14 days earlier and increase the fraction of third generation hatch (Stöckle et al. 2010). Many countries have already documented earlier bloom times for a variety of plants (Ellwood et al. 2013; Grab and Craparo 2011; Guédon and Legave 2008; and others). Earlier bloom times will in turn affect pollination rates as insects and crops adjust to climate change at different rates. Mismatches between pollinator-dependent specialty crops (tree fruits and berries) and pollinators may lead to a significant decrease in yields (Settele et al. 2016). Pollination from both honey bees and native bees is critical for tree fruit and berry crops grown in the Pacific Northwest (Sagili and Caron 2016; Rucker et al. 2012). Although, some studies have shown temporal mismatch between some flowering plants and pollinators due to climate change (Burkle et al. 2013; Robbirt et al. 2014), there is a knowledge gap regarding such phenological mismatches between pollinator-dependent agricultural crops and bees, and their impact on pollination (Settele et al. 2016). The potential for such phonological mismatch is greater for native bees such as bumble bees that hibernate during winter and whose emergence in spring is dependent on prevailing temperatures during the hibernation period (Pyke et al. 2016). Extreme temperatures will impact fruit quality by altering important quality parameters such as fruit firmness and synthesis of sugars, organic acids, and antioxidant compounds (Moretti et al. 2010; Diamantidis et al. 2002; Yamada and Kobayashi 1999; Tromp 1997; Yamada et al. 1994). For example, many apples grown today are softer and less tart than they were 40 years ago (Sugiura et al. 2013) because high temperatures during the pre-harvest period reduce firmness (Blanke and Kunz 2009; Tromp 1997) and acidity (Tromp 1997; Yamada et al. 1994) of apples. Choudhary et al. (2015) found that a 10 °C increase in temperature can cause a 50% reduction in tartaric acid content. Frequent exposure of apple fruit to high temperatures can result in sunburn, development of watercore, and loss of texture (Choudhary et al. 2015; Yamada and Kobayashi 1999). Currently, sunburn is usually the largest source of cullage in apples, with losses in Washington State averaging about 10% of the crop (Schrader et al. 2003). Certain effects, such as lenticel marking, which causes pitting on the skin, and sunburn scald, are particularly important to packers because they do not appear until after packing and storage and can reduce confidence in future sales (Curry et al. 2008). Heat stress also affects the quality of berries and commonly results in soft fruit and skin damage, downgrading the quality of the crop from the fresh to the processed market (Bañados et al. 2002; Ehlenfeldt and Martin 2002). Agricultural industries may have to invest in new varieties to avoid lost profitability (Rosenzweig et al. 2011). Breeders have been breeding for low-chill varieties and currently have several such options available. For example, Fuji and Pinklady apples require only 200–400 chill hours, and Minnie Royal and Royal Lee are two cherry varieties that only require 200–300 chill hours (davewilson.com). One problem with relying on breeding for adapting to climate change is that breeding programs for woody perennial crops such as grapes, berries, and especially fruit trees are hindered by their long generation time, large plant size, long juvenile phase, and the necessity to wait for the physiological maturity of the plant to assess the marketable product (Iwata et al. 2016; McFerson 2015). However, advancements in marker-assisted breeding and phenomics are promising and could accelerate development of climate-ready fruit and nut crops (Batley and Edwards 2016; Lobos and Hancock 2015). Producers will need to monitor chilling hours and freezing conditions in their regions with an eye towards phasing in cultivars to match their particular climatic conditions. Determining when to replace varieties will require reliance on research related to climate trends and crop models, as well as outreach and decision support tools that can aid in interpreting these trends. Such decisions will require significant lead time and capital investment due to the lengthy time span between planting and full fruit production. Low-chill varieties, such as Fuji and Pink Lady apples, are already being grown in the Northwest and may become more prevalent as the climate warms. Currently, they represent about 16% of the fresh market apple production (Northwest Horticultural Council 2016). Several methods of frost protection currently used by producers include wind machines, stack heaters, sprinklers, management methods for delaying bud break, and managing the height of cover crops. Several such methods are described in Perry (1988). Poling (2008) has shown that wind machines have proven to be a cost-effective investment for vineyards prone to frost damage in North Carolina and that bud break can be delayed by several days using dormant oils, late pruning, and evaporative cooling from sprinklers. Overhead sprinkling systems are also effective and can provide excellent protection down to −7 °C, even during advection frosts (Snyder and Melo-Abreu 2005). Mowing cover crops in vineyards before bud break can also help by pooling cold air below the bud zone during a frost (Skinkis 2016 ). Protecting crops from heat stress and sun scald will also be necessary to maintain fruit quality. When heat-tolerant fruit varieties are not an option, heat damage can be reduced by pruning the canopy to prevent direct exposure to sunlight, applying clay, calcium carbonate, or wax emulsion sprays, and scheduling irrigations to reduce heat stress. More costly methods such as shade cloth and overhead sprinkler cooling systems are commonly used in the apple and blueberry industry, where the economic consequences of heat damage are very large (Evans 2004; Lobos et al. 2013; Yang and Bryla 2016). In eastern Washington State for example, overtree or microjet sprinkling has been used for evaporative cooling to enhance color formation (Iglesias et al. 2000). New orchards could also be planted at higher elevations or latitudes. Heat stress will also make cooling for storage and transport more important (Moretti et al. 2010) as post-harvest cooling slows ripening, maintains firmness, inhibits pathogenic microbial growth, and minimizes water loss (Talbot and Chau 2002). Several climate adaptation strategies were presented here, but not all will be adopted by producers due to logistical and economic considerations. As Mote et al. (2014) stated, while the agriculture sector’s technical ability to adapt to changing conditions can offset some adverse impacts of a changing climate, there remain critical concerns for agriculture with respect to costs of adaptation, development of more climate resilient technologies and management, and availability and timing of water. In order to develop a comprehensive management strategy, producers will need to gather both short and long-term future climate conditions for multiple climate variables and thresholds related to specific crops, economical adaptation methods, and consequences for other inputs and management goals. A way to evaluate the tradeoffs associated with the costs and benefits of each adaptation method also needs to be considered. A first step in developing a management strategy is to identify important climatic variables and thresholds and obtain projections for these variables at a relevant scale. Olen et al. (2015) have taken a step in this direction by mapping the variability of damage thresholds for key variables such as freeze dates and minimum and maximum growing season temperatures, for Oregon, Washington and Idaho (Figs. A1 and A2). The next step is to create these same thresholds for future climate change scenarios. Climatologists currently have dozens of climate models that they use to make global and regional climate projections under a variety of future emission scenarios. One example is the Multivariate Adaptive Constructed Analogs (MACA) Statistically Downscaled Climate Datasets (http://maca.northwestknowledge.net) that are being used to create projections of threshold variables of interest to producers and are available at http://nwclimatetoolbox.weebly.com/ with more variables to be included in the future. These tools can be used to visualize conditions at individual points or visually displayed on maps to identify both current and future time horizons in order to inform management decisions. These tools are designed to be used by producers without the aid of crop advisors or extension personnel. Adaptive strategies require technological skills and training, investment in equipment and technologies, and both high and low skilled workers to implement the new strategies. Individuals must weigh the benefits and costs of adoption and assess the environmental and economic tradeoffs associated with alternative practices. One way to do this is with farm level decision support tools such as AgBiz Logic™ (agbizlogic.com), a farm level finance tool developed at Oregon State University that incorporates climate, finance, and lease considerations into farm management decisions regarding financial viability and feasibility of management practices. By using data unique to individual farming operations, changes in net returns and cash flows can be compared for multiple management strategies to determine which practices best fit their operations under a changing climate. For a detailed example, see Capalbo et al. (2017). Climate change will result in economic challenges as producers move operations to more suitable climates, change cropping systems, or invest in adaptation methods. While the technical ability to adapt can offset some adverse effects of a changing climate, there remain critical concerns with respect to costs of adaptation, development of climate resilient technologies and management, and availability of irrigation water. Wide variations within spatial and temporal dimensions of climate will affect agricultural production patterns and net returns. Such variations necessitate a greater understanding of the microclimates and the risks that a changing climate may confer upon agricultural producers. In order to develop a comprehensive climate change management strategy, localized information on the variability of key climate variables and damage thresholds, such as freezing dates, growing degree days, and spring warming relating to specific crops, is needed. Improved information regarding changing lifecycles of pests and the effectiveness of adaptation and management strategies, as well as the relative costs for these changes is also needed. Specialty crops are important to the agricultural economy of the Pacific Northwest; the need to ensure the continued availability of these products to consumers at reasonable costs is equally important. These crops are critical to our quest for a more healthy and sustainable diet. Research aimed at mitigating climate risk effects and investments in innovative technologies that can increase net returns is paramount to the future viability of these sectors. Research needs include (1) continued funding for experiment station style field trials that quantify impacts of new technologies and varieties on yields and costs and for maintaining the data sets on yields, inputs and costs that have proven so valuable in understanding the long-term impacts of changes in economic and environmental factors; (2) support for innovative technologies and crop varieties that focus on specific challenges including reduced chilling degree days, increasing labor costs and changes in nutrition impacts; and (3) funding for decision support tools that utilize the spatial and site-specific data on soil and climate conditions and crop-specific vulnerabilities to better inform future management scenarios. Decision support tools that seamlessly link with research on climate risks and productivity, and allow agricultural sectors to better understand innovative options and opportunities are fundamental to translating the research to outcomes. In all of these research endeavors, the research community should seek partnerships with the private sector to design information and data sharing arrangements which will accelerate bringing innovations to market and enhancing people’s lives regionally and globally. Melillo JM, Richmond TC, Yohe GW (eds) (2014) Climate Change Impacts in the United States: The Third National Climate Assessment. U.S. Global Change Research Program, 841 pp. doi: 10.7930/J0Z31WJ2.